Chronology of the U.S. Brewing Industry. 1587 Virginia colonists brew ale using corn. 1607 First shipment of beer arrives in the Virginia colony from England. 1609 American "Help Wanted" advertisements appear in London seeking brewers for the Virginia Colony. 1614 The first non-native American is born in New Amsterdam, (perhaps the first non-native American male born in the New World) in Block & Christiansen's brewhouse. Jean Vigne grows up to become the first brewer horn in the New World. 1620 Pilgrims arrive in Plymouth in the Colony of Massachusetts aboard the Mayflower. Beer is extremely short on board ship and the seamen force the passengers ashore to ensure that they will have sufficient beer for their return trip to England. 1632 The West India Company builds a brewery on Brewers Street in New Amsterdam led by Governor Van Twiller. 1633 Peter Ninuit establishes a brewery at Market Field on Manhattan Island. 1634 Samuel Cole is the first to be licensed in Boston to operate a tavern. 1637 First authoritatively recorded brewery in the Massachusetts Bay Colony under the control of Captain Sedgwick. 1639 Sergeant Bauleton is placed in charge of a brewhouse in Providence, Rhode Island. 1670 Samuel Wentworth of Portsmouth obtains the first license to brew beer in New Hampshire. 1683 William Penn's colony erects a brewery at Peonshury near Bristol, Pennsylvania. 1683 William Frampton erects the first brewery in Philadelphia on Front Street between Walnut and Spruce at the Dock Street Creek. 1734 Mary Lisle, the first known "brewster" in America, takes over her late fathers Edinburgh Brewhouse in Philadelphia, which she operates until 1751. 1738 Major William Horton builds the first brewery in the deep south at Jekyll Island, Georgia. 1754 George Washington enters a beer recipe in his notebook. 1762 The Theory and Practice of Brewing by Michael Combrune is published. This is the first attempt to establish rules and principles for the art of brewing. 1765 The British Army builds a brewery at Fort Pitt (Pittsburgh, PA). The first brewery west of the Allegheny mountains. 1765 A brewery is built in the French colonial settlement of Kaskaskia in what is now Illinois. It is the first brewery outside the 13 colonies. 1772 A mixture of dark to light malts called "Porter" is concocted in England. Exports begin to America but it fails to gain popularity. 1774 Robert Smith begins a modest ale brewing venture at Saint John & Noble Streets in Philadelphia. Through relocations and buy outs, the Robert Smith brand will survive until 1986 - 212 years. 1774 The Single Brothers Brewery and Distillery opens in the Noravian religious settlement of Salem, North Carolina. 1775 Revolutionary War measures by Congress include rationing to each soldier one quart of Spruce Beer or Cider per man per day. 1789 George Washington presents his "buy American" policy indicating he will only drink porter made in America. 1789 Massachusetts passes an Act encouraging the manufacture and consumption of beer and ale. 1792 New Hampshire agrees not to tax brewing property. 1793 Philadelphia produces more beer than all the other seaports in the country. 1808 Nembers of the Congregational Church in Moreau, Saratoga County, New York form a temperance society. 1810 132 operating breweries produce 185,000 barrels of beer. Population of the country is 7 million. 1810 Jacques Delassas de St. Vrain begins brewing in St. Louis, Missouri (brewery destroyed by fire in 1812). 1815 The American Brewer and Maltster by Joseph Cappinger is published. 1819 A steam engine built by Thomas Holloway is installed in the brewery of Frances Perot in Philadelphia. This is the first engine to be used in beer production in America. 1819 Nathan Lyman starts the first brewery in Rochester, New York. 1820 Brewers report business off due to increased consumption of whiskey. 1826 American Society for the Promotion of Temperance formed in Boston (also known as the American Temperance Society). 1829 American Temperance Society has 100,000 members. 1829 David G. Yuengling opens a brewery in the Pennsylvania coal town of Pottsville. It continues in 1995 as the oldest operating brewery in the United States, still owned by the Yuengling family. 1830 Jacob Roos builds the first brewery in Buffalo, New York. 1832 Secretary of War Lewis Cass cancels the ration of liquor to the military. 1833 William Lill & Co. (Heas & Sulzer) start the first commercial brewery in Chicago and produce 600 barrels of ale in their first year. 1833 Membership in the country's five thousand temperance societies exceeds one and one quarter million. 1836 United States Temperance Union meets in Saratoga, Now York and changes name to American Temperance Union. Principle of total abstinence or "Teetotalism" is introduced. 1837 Rice and Kroener establish the first brewery in Evansville, Indiana. 1840 Philadelphia brewer John Wagner introduces lager beer. 1844 The Fortmann and Company Brewery introduces lager beer to Cincinnati. 1844 Jacob Best starts a brewery in Milwaukee which later becomes the Pabst Brewing Co.
1848 John Roesele starts a lager beer brewery in Boston. 1846 Maine passes prohibition law. 1847 John Huck and John Schneider start the first lager beer brewery in Chicago. 1848 Unrest in Germany causes many Germans to emigrate to America. 1849 August Krug forms a brewery in Milwaukee which evolved into the Schlitz Brewery. 1849 Adam Schuppert Brewery at Stockton and Jackson Streets in San Francisco becomes California's first brewery. 1850 Mathias Frahm establishes Davenport, Iowa's first brewery. 1850 431 breweries in the country produce 750,000 barrels of beer (31 gallons per barrel). The population is 23 million. 1852 George Schneider starts a brewery in St. Louis, Missouri. This brewery is the seed of the Anheuser-Busch Brewery. 1852 San Francisco has 350 bar rooms to serve the hard-drinking population of 36,000. 1852 Henry Saxer starts a brewing business (City Brewery) in Portland, Oregon Territory. This brewery was later owned by Henry Weinhard. 1852 Prohibition comes to Vermont. 1852 Prohibition adopted in Massachusetts (repealed in 1868). 1852 Rhode Island enacts prohibition (repealed in 1863). 1852 Territory of Minnesota enacts a short-lived prohibition. 1853 Prohibition voted in for Michigan. 1854 Prohibition begins in Connecticut. 1855 German brewer William Menger starts a lager beer brewery in San Antonio, Texas. This is the first brewery in that city. 1855 Prohibition adopted in MNew York, New Hampshire, Delaware, Indiana, Iowa, and the Nebraska Territory. 1856 The Benedictine Society of Saint Vincent's Abbey opens a commercial brewery in their Monastery near Latrobe, Pennsylvania. 1857 The largest brewery in the West is the Chicago brewery of William Lill and Michael Diversey. 1859 Solomon, Taecher & Co. start Colorado's first brewery, the Rocky Mountain Brewery. 1860 1269 breweries produce over one million barrels of beer for a population of 31 million. New York and Pennsylvania account for 85% of the production. 1861 Internal Revenue System introduced. 1862 Internal Revenue Act taxes beer at the rate of one dollar per barrel to help finance the government during the Civil War. 1862 37 New York breweries form an association that would officially become the United States Brewers Association in 1864. 1863 161,607 barrels of beer are produced in the New England states. 1863 Thomas Smith, Christian Ritcher, and Henry Gilbert found the first brewery in Montana Territory (Virginia City). 1865 Mathew Vassar, a prominent Poughkeepsie, New York brewer, founds Vassar College, the first privately endowed school for women. 1865 National Temperance Society and Publication House formed in Saratoga, New York. 1866 Internal Revenue issues stamp regulations requiring application of tax stamps to barrels of beer leaving the brewery. 1866 Levin & Co.'s pioneer Brewery in Tucson is the first to operate in the Arizona Territory. 1867 Prohibition efforts in Iowa and New York fail. 1867 3700 breweries in operation in America producing 6 million barrels of beer. 1868 John Siebel opens a brewing school which later becomes the Siebel Institute of Technology. 1868 Publication of the monthly magazine The American Brewer begins in January. 1869 Prohibition Party organized in Chicago. 1869 Another prohibition law enacted in Massachusetts (repealed 1875). 1869 Best Brewing Co. (later Pabst) begins expansion in Milwaukee with the purchase of Charles T. Melms' Brewery. 1871 A number of Chicago breweries destroyed by fire started by Mrs. O'Leary's cow: Doyle & Co., Huck, Jerusalem, Lill & Diversey, Metz, Mueller, Sands, and K. G. Schmidt. 1872 Anheuser adopts A and Eagle trademark. 1872 First brewery workers' strike in New York City. 1872 Prohibitionist presidential candidate James Black draws 5608 votes. 1873 4131 breweries (record number) produce 9 million barrels of beer. 1873 Adolphus Busch begins bottling of beer for large scale shipments at the Anheuser Brewery in St. Louis (bottling was not new - only the magnitude of this venture). 1874 Woman's Christian Temperance Union formed. 1875 First lager beer in California brewed by Boca Brewing Co. in Boca. 1876 Louis Pasteur publishes "Studies on Beer" showing how yeast organisms can be controlled. 1877 George Ehret of New York is the largest brewer in the country. 1879 Ballantine adopts three ring trademark. 1880 Frederick Salem authors "Beer, Its History and Its Economic Value as a National Beverage." The book is his argument for beer as a temperance measure. It offers the motto "Beer against Whisky." 1880 Internal Revenue Department records indicate 2830 ale and lager breweries in operation. 1880 U. S. Brewers Academy established. 1880-1910 Number of breweries declines. Improved methods of production and distribution mean fewer breweries can manufacture more beer. By 1910 number of breweries drops to around 1500. 1882 National Brewers' and Distillers' Association formed. 1884 Adolphus Busch of St. Louis and Otto Koehler establish the Lone Star Brewing Co. in San Antonio, Texas. 1885 An injunction closes the John Walruff Brewery in Lawrence, Kansas which had flaunted prohibition laws for five years. He appeals on the basis that prohibition laws constitute illegal confiscation of property. 1886 John Walruff wins appeal in lower courts. Case taken to Supreme Court. 1886 National Union of the Brewers of the United States established. 1886 Abraham Cohen establishes the first brewery in Alaska at Juneau. 1887 United States Supreme Court rules in John Walruff case that Kansas was not depriving Walruff of his property, but merely abating a nuisance and prohibiting the injurious use of that property. 1887 Master Brewers' Association organized. 1887 Tuscarora Advertising Company formed in Coshocton, Ohio producing a wide variety of advertising items. 1888 Standard Advertising Company founded by H. D. Beach in Coschocton, Ohio in competition with Tuscarora Advertising. 1888 Brewery employees strike in New York, Chicago, and Milwaukee. 1889 A British syndicate proposes a plan to merge Schlitz, Pabst, and Blatz in Milwaukee. Schlitz and Pabst decline the offer. Blatz sells part of its business to Milwaukee and Chicago Breweries Ltd.
1892 Crown cap invented by William Painter of Crown Cork and Seal Co. in Baltimore. 1892 Wood pulp coaster invented by Robert Smith of Dresden, Germany. 1893 Anti-Saloon League founded by Rev. Howard Hyde Russell with the goal of suppressing the saloon. 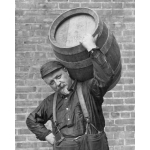 1898 Beer barrel tax raised to $2.00 during Spanish American War. Beer sales decline. 1898 The Royal Brewery is the first to operate in Hawaii. 1899 The Pittsburgh Brewing Company formed by the consolidation of twenty one Pittsburgh brewers. 1900 Woman's Christian Temperance Union member Carrie Nation does a hatchet job on the Carey Hotel in Wichita, Kansas. 1901 Ten Boston brewers merge into Massachusetts Breweries Company, Ltd.
1901 Sixteen Baltimore brewers consolidate into the Gottlieb-Bauernschmidt-Straus Brewing Company. 1901 Barrel tax on beer reduced to $1.60. 1902 Barrel tax on beer reduced to $1.00. 1905 Independent Brewing Company formed by fifteen Pittsburgh breweries. 1909 United States Brewers Association yearbook discusses the problems of poor conditions in saloons and the need for a cleanup. 1912 Nine states vote dry. 1913 Webb-Kenyon bill passed prohibiting the interstate shipment of alcoholic beverages to dry states. 1914 Resolution to prohibit liquor through a constitutional amendment loses in the House due to lack of required two-thirds majority vote (197 for, 190 against). 1914 Secretary of Navy Josephus Daniels orders prohibition of alcohol on Naval ships and Naval installations. 1916 Six San Francisco breweries consolidate. 1917 District of Columbia passes a prohibition law. 1917 Distilleries closed by Food Control Law. 1919 18th Amendment to the U.S. Constitution ratified on January 16 calling for national prohibition to take effect one year from the date of ratification. 1919 House of Representatives Bill No. 6810 presented in May by Rep. Volstead establishing the apparatus for the enforcement of prohibition. The bill was passed October 10, vetoed by President Wilson on October 27. The veto was subsequently overridden by Congressional vote. 1920s Near beers brewed during prohibition: Pablo by Pabst, Famo by Schlitz, Vivo by Miller, Lux-O by Stroh and Bevo by Anheuser-Busch. 1920 Association Against the Prohibition Amendment organized by William H. Stayton. 1921 300 million gallons of "near beer" produced. 1922 Prohibitionist Volstead defeated in Minnesota elections. 1922 Anthony & Kuhn Brewery of St. Louis sold to a laundry. 1923 The Moderation League is formed. 1926 Montana votes to repeal the state prohibition enforcement law. Other states follow suit. 1929 The Women's Organization for National Prohibition Reform started. 1930 The Crusaders formed protesting the lawlessness, crime, and corruption brought on by Prohibition. 1930 American Brewers Association formed. 1931 American Legion votes for a referendum of national prohibition. 1932 86 million gallons of near beer produced. 1933 The Cullen Bill is passed in March allowing states which did not have state prohibition laws to sell 3.2% beer. It also instituted a $5.00 per barrel tax on beer. On April 7, 1933 the legalization of beer takes effect via the 21st Amendment repealing the 18th. 1933 31 brewers back in operation by June. 1934 756 brewers back in operation. 1935 Canned beer introduced by American Can Company and Krueger Brewing Co. of Newark, New Jersey on June 24. 1935 Schlitz introduces cone top can produced by Continental Can Company. 1935 Falstaff Brewing Co. of St. Louis leases the Krug Brewing Company of Omaha, Nebraska. This touches off a wave of acquisitions by large brewers. 1936 United Brewers Industrial Foundation formed. 1936 Brewing Industry, Inc. formed. 1940 Beer production at level of preprohibition years with half the number of breweries in operation as in 1910. 1940 Barrel tax raised from $5.00 to $6.00. 1941 All brewers' associations united under the United States Brewers' Association. 1943 Brewers are required to allocate 15% of their production for military use. 1944 Barrel tax raised to $8.00. 1949-1958 185 breweries close down or sell out. 1950 407 breweries in operation. 1951 Anheuser-Busch of St. Louis builds a new brewery in Newark, New Jersey starting a trend for expansion of breweries. 1951 Barrel tax raised to $9.00. 1953 Anheuser-Busch buys the St. Louis Cardinals baseball team. 1954 First l6oz can introduced by Schlitz. 1959 Aluminum can introduced by Coors of Golden, Colorado. 1960 Aluminum can top introduced. 1961 230 breweries in operation. Only 140 are independently run. 1962 Tab top can introduced by Pittsburgh Brewing Company. 1965 "Ring Pull" can introduced. 1969 Canned beer outsells bottled beer for the first time. 1969 Fritz Maytag takes ownership of the Anchor Brewing Co. in San Francisco, CA. It is not obvious at the time, but a revolution has begun. He brews high quality beer for non-main stream tastes. 1970 A small group of collectors of brewery advertising items form the first club in the nation devoted to that hobby - The Eastern Coast Breweriana Association (ECBA). 1971 Philip Morris Co. acquires Miller Brewing Co.
1972 State of Oregon becomes the first state to adopt a container deposit law. 1977 The first ale is served in a new brewery in Sonoma, CA. Jack McAuliffe's venture is short lived, but the New Albion Brewery will become known as America's first "Micro Brewery", or "Craft Brewery". 1982 For the first time since prohibition, a brewery is allowed to open that not only sells its' beer at its' own bar on premises, but serves food to boot. In Bert Grant's Yakima Brewing and Malting Co., Inc., the Brew Pub is born. 1983 In January, 51 brewing concerns are operating a total of 80 breweries. This is the low water mark for breweries in the 20th century. 1983 The top six breweries (Anheuser-Busch, Miller, Heileman, Stroh, Coors, and Pabst) control 92% of U. S. beer production. 1984 44 Brewing concerns are operating a total of 83 breweries. 1984 Micro Breweries begin to spread: Riley-Lyon (AR): Boulder (CO); Snake River (ID); Millstream (IA); Columbia River (OR); Kessler (MT); Chesapeake Bay (VA). 1984 Manhatten Brewing Co., in New York City's SOHO section, becomes the first Brew Pub on the east coast. 1990 307 years after William Frampton opened his brewery on Philadelphia's Dock Street Creek, he is memorialized through the opening of the Dock Street Brewing Co.
1990 Producing 31,000 bbls. of beer, the Sierra Nevada Brewery in Chico, CA becomes the first start up micro brewery to break out of that classification (considered 25,000 bbl or less). 1994 It becomes legal to put the alcohol content of beer on containers. 1994 California begins the year with 84 Micro Breweries or Brewpubs in operation - one more than there were breweries in the nation 10 years earlier. 1994 Attendees at the Woman's Christian Temperance Union convention are admonished to recapture the spirit of Carrie Nation. 1995 Approximately 500 breweries are operating in the United States, and they are estimated to increase at a rate of 3 or 4 per week. 1995 American Breweries II is published.